awight moved T216837: Edit conflict preview not working on big pages from Doing to Review on the WMDE-QWERTY-Sprint-2019-04-17 board. As you said, POST is all that we needed here. I got fancy and only POST when submitting content via a request parameter. awight claimed T216837: Edit conflict preview not working on big pages. awight added a comment to T220200: Horizontal scrollbar on reference previews is hidden by the vertical fadout. I couldn't find a CSS-only fix, but maybe we can implement in JS by pushing the gradient mask up by the scrollbar height? FWIW, I tried a lazy workaround, giving the gradient a z-index of -1 and moving the mw-parser-output block to -2, but then it becomes impossible to scroll the popup. awight moved T220196: Reference previews broken with umlauts on named references from Sprint Backlog to Review on the WMDE-QWERTY-Sprint-2019-04-17 board. awight added a comment to T220196: Reference previews broken with umlauts on named references. Looks like this extra URI decode is all we'll need. Interestingly, on my local the titles are not encoded like this, only the fragment is. These edits verify that the problem only happens when a reference name includes high bits (or something), on dewiki. Tested with diaeresis "a" and a latin-extended character. Noting that I've checked out these extensions at versions matching dewiki production, and still don't see this bug locally. Correction to my previous comment: I was able to reproduce the bug where the Fläche citation won't appear on de.wikipedia.org, but when I set up the test case locally this popup rendered correctly. Maybe that's an interesting clue? I'll play around to see what the difference might be between my configuration and dewiki production. awight claimed T220196: Reference previews broken with umlauts on named references. I was able to reproduce the bug locally, will see how far I can debug. awight added a comment to T216425: Volunteer NDA for AWight. awight added a comment to T220377: Check PPI leftovers - awight. Thanks for asking! Everything in those home directories can be safely deleted. awight added a member for WMDE volunteer workboard: awight. awight added a member for TCB-Team: awight. awight created T219710: Accept alternative image URLs. awight moved T144100: Pageview dumps incorrectly formatted, need to escape special characters from Patch pending review to Patch pending deployment on the Security board. awight moved T144100: Pageview dumps incorrectly formatted, need to escape special characters from MediaWiki/Security Team/To triage to Patch pending review on the Security board. awight awarded T133452: Create temporary accounts for anonymous editors a Love token. awight updated the task description for T133452: Create temporary accounts for anonymous editors. awight closed T219370: Remove stale Gerrit identity for awight as Resolved. Have you tried changing the email address on https://wikitech.wikimedia.org/wiki/Special:Preferences#mw-prefsection-personal already? awight added a member for Move-Files-To-Commons: awight. awight added a member for WMDE-QWERTY-Team: awight. awight created T219471: mwdumper should use bulk load optimizations. awight added a comment to T21883: Errors dumping into PostgreSQL database. New patch version, the constraints are also deferred at each new checkpoint. awight added a comment to T219370: Remove stale Gerrit identity for awight. Thanks for looking at this. I reloaded and it looks the same. When I try to set preferred email to my personal address and save changes, I get realm does not allow editing name. The full context is that I'm continuing to use my account for volunteer purposes, so what I'm trying to do is switch it over to use spam@ludd.net to preferred email. I'm still unable to do that from the web UI, maybe I just need to wait for changes to propagate though. awight created T219370: Remove stale Gerrit identity for awight. awight added a comment to T156656: Review parent task for any potential pageview definition improvements. awight added a comment to T153800: Document the MediaWiki command-line installer. There is some built-in usage documentation printed on the command-line, now. However, it's in need of maintenance, badly needs full examples, and the optional vs. required parameter hints are incorrect. According to the usage docs, we should be able to call php maintenance/install.php ADMINNAME but that doesn't work, many more arguments are necessary. awight added a comment to T144100: Pageview dumps incorrectly formatted, need to escape special characters. awight moved T144100: Pageview dumps incorrectly formatted, need to escape special characters from Backlog to Active on the Datasets-General-or-Unknown board. Restricted Application added a project to T65402: csv upload tricks you into staring at a "Refresh" button: Analytics. Restricted Application added a project to T65401: Reports download with the filename "Bytes": Analytics. Restricted Application added a project to T56300: "Created" date in report queue showing up strange: Analytics. Restricted Application updated subscribers of T55786: Make the name of the country available as parserfunction. Restricted Application added a project to T46186: Rendered output should be cached. : Internet-Archive. Restricted Application added a project to T46185: Store created books on a server, not in the browser: Internet-Archive. Restricted Application updated subscribers of T216504: page-links-change stream is firing events related to transcluded template caches. Restricted Application updated subscribers of T187362: Failure in EventBus schema for mediawiki/revision/visibility-change. Restricted Application updated subscribers of T187360: Changeprop should log the URL when it fails to connect. Restricted Application added a project to T160489: Port RecentChangesFlags to structured filters: Growth-Team. Restricted Application added a project to T117425: Develop manual testing strategy for bias detection: artificial-intelligence. awight renamed T144100: Pageview dumps incorrectly formatted, need to escape special characters from Pageview dumps incorrectly formatted, looks like a result of possibly malicious activity to Pageview dumps incorrectly formatted, need to escape special characters. awight added a comment to T152628: Reject MediaWiki requests which use an URL with an invalid title but use some alternative mechanism to specify a valid page. awight claimed T144100: Pageview dumps incorrectly formatted, need to escape special characters. awight created T216425: Volunteer NDA for AWight. 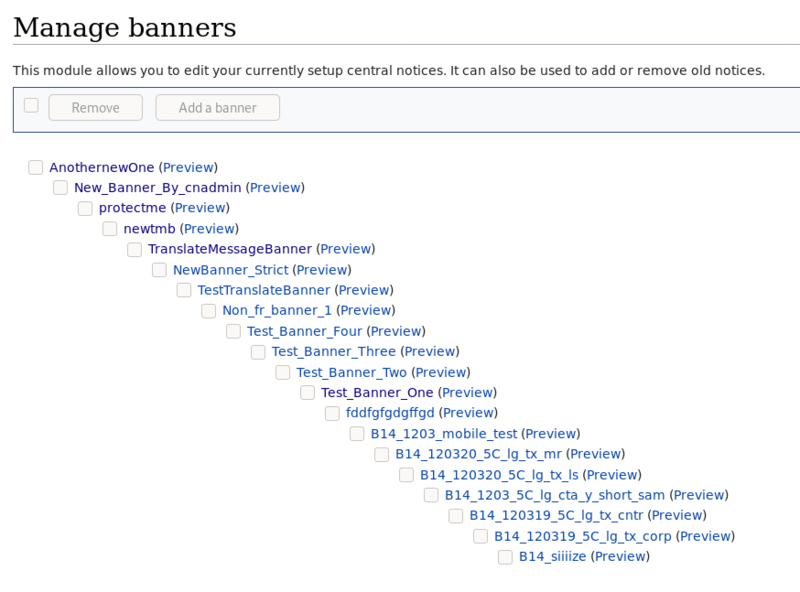 awight added a comment to T161907: CentralNotice: Remove unused code for banner preview in banner editor. 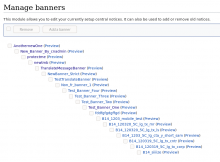 awight created T216077: CentralNotice should be able to detect supported languages for a banner. awight updated subscribers of T214545: Emit synthetic mediawiki.revision-score events for both datacenters. awight closed T214960: Jade workshop position paper for HumBL as Declined. Didn't have time to do this, regrettably. awight updated the task description for T215431: Weigh Kubernetes vs. streaming architecture for ORES "2.0". awight created T215431: Weigh Kubernetes vs. streaming architecture for ORES "2.0". awight added a comment to T211434: Prototype a bot framework that utilizes newcomerquality. awight added a comment to T214874: Investigate a Hyperswitch frontend for ORES. awight updated the task description for T214960: Jade workshop position paper for HumBL. awight created T214960: Jade workshop position paper for HumBL. awight created T214958: MCR: include slot role or ID in Hive mediawiki_history table. awight updated the task description for T212380: Jade Wireframes: Search integration. awight committed rODQbce1318d64fa: Store big dataset using LFS (authored by awight). GitHub <noreply@github.com> committed rODQ8e972931a415: Merge pull request #22 from wikimedia/revscoring_2.3.0 Updates for revscoring 2. (authored by awight). awight committed rODQfb3c1ad9b3e3: Rebuild the model for revscoring 2.2.2 (authored by awight). awight committed rODQ31cfb2370b81: Rebuild English model with new badwords Bug: T196468 (authored by awight). awight committed rODQdd8f0a80c41f: Rename script (authored by awight). awight committed rODQbad5d875b106: Fix typo in makefile (authored by awight). awight committed rODQb7b842f474af: Bump revscoring to 2.2.2 (authored by awight). awight committed rODQ0a644574e843: Update tuning config for revscoring 2 Bug: T184727 (authored by awight). awight committed rODQfeed7866da53: Lint fixups (authored by awight). awight committed rODQ6e74e3878294: Make codecov less obtrusive (authored by awight). GitHub <noreply@github.com> committed rODQ1b01648c697b: Merge pull request #12 from nettrom/master Add NLTK Wordnet requirement to… (authored by awight). awight committed rODQ4a2e3aad5ddc: Remove target files when commands error out See https://phabricator.wikimedia. (authored by awight). Remove target files when commands error out See https://phabricator.wikimedia. awight committed rODQ7237c4049db5: Add default make target (authored by awight). awight committed rODQb39f44146ab8: Use automatic Make variables for easy of eyeballs (authored by awight). awight created T214874: Investigate a Hyperswitch frontend for ORES. awight created T214873: Investigate using Cassandra for the score cache. awight added a project to T213978: Deprecation warning from CentralNotice: OutputPage::parseInline: Fundraising-Backlog. awight added a comment to T213978: Deprecation warning from CentralNotice: OutputPage::parseInline. awight added a comment to T214723: Modify revscoring extract utility to include root datasources. awight added a comment to T213943: Support custom permissions for a subset of translatable pages. GitHub <noreply@github.com> committed rOEQ7f295d6d6827: Merge f0fc919764666c0b188df82790443c39c2ba05c1 into… (authored by awight). awight committed rOEQf0fc91976466: Fix a typo in generated parameters (authored by awight). awight created T214723: Modify revscoring extract utility to include root datasources. awight added a comment to T211069: Decide whether we will include raw features. awight committed rORES26348be88c7d: Add tests for redis task tracker and score cache (#306) (authored by Ladsgroup). awight closed T210026: Foundation site Board of Trustees page is information-free as Resolved. awight updated the task description for T213943: Support custom permissions for a subset of translatable pages. awight committed rOEQ401686af99e8: Add eswikiquote damaging and goodfaith, remove reverted, Try II (#180) (authored by Ladsgroup). awight added a reverting change for rOEQ6b8d7419e0f1: Revert "Add eswikiquote damaging and goodfaith, remove reverted": rOEQ401686af99e8: Add eswikiquote damaging and goodfaith, remove reverted, Try II (#180).